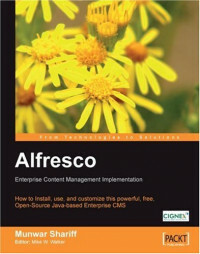 This well-crafted and easy-to-use book is a complete guide to implementing enterprise content management in your business using Alfresco. It guides you through creating smart, collaborative content repositories, and shows how to use Alfresco to create more elegant document sharing, better collaborative working, and reliable automated workflow processes. Alfresco offers Enterprise Content Management (ECM) aspires to be "Documentum fast and free", and was founded by a former Documentum executive. Alfresco can store a wide range of digital content in flexible, smart "spaces". Content is accessible through a web interface, shared network folders, FTP, WebDav, and other methods. Users can set up Alfresco to process content in certain ways, according to business rules and workflow requirements. It can also apply version control to documents automatically, making it easy and safe to collaborate and update documents. Alfresco is regarded as the most powerful open-source enterprise content management system. Using Alfresco, administrators can easily create rich, shared content repositories. This book shows you how to unleash this power to create collaborative working systems in your enterprise. This book will take you through the complete cycle of planning, implementing and customizing your ECM installation. Among the many topics covered are: Working with users and membership accounts, including LDAP integration Using Alfresco as a Smart document repository; working with automatic version tracking and control, and accessing the repository from the Web, shared network folders, or FTP Making content easy to find using search, content categorization, and metadata Automating document management tasks with business rules and complete workflows Working together using Alfresco's collaboration and syndication features to create effective working groups Customizing the user interface, creating your own dashboard layouts; presenting content in custom ways relevant to your business Approach Munwar Shariff is an experienced software trainer for CIGNEX Inc. He has trained many users, administrators, and developers in Alfresco and many other systems. This book distils the hands-on approach of his training courses into a concise, practical book. The emphasis is on getting up and running fast and discovering the scope and power of Alfresco incrementally through practical discovery. This book is designed for system administrators, experienced users or developers who want to install and use Alfresco in their teams or businesses. Because Alfresco is free many teams can install and experiment with its ECM features without any upfront cost, often without management approval. The book assumes a degree of technical confidence but does not require specialist sysadmin or developer skills to get a basic system up and running. Alfresco is particularly suitable for IT consultants who want or need to set up a flexible enterprise content management system for their clients, be that for demonstration, development, or as a mission-critical platform. This book gets you to that result quickly and effectively.